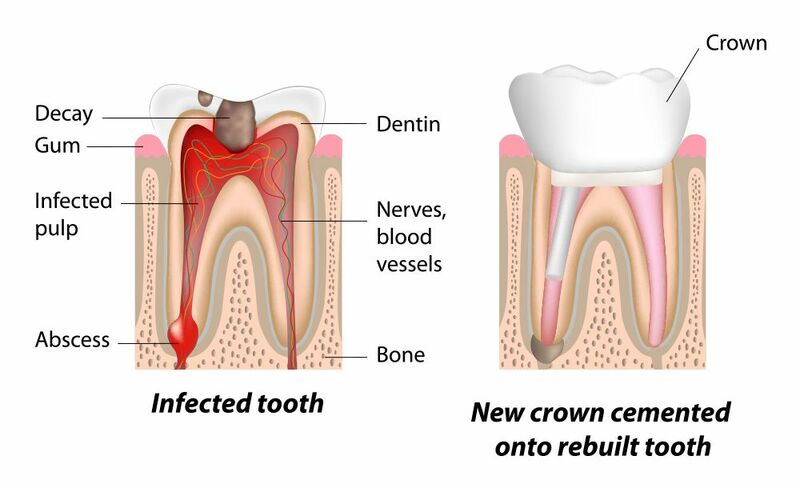 Bacteria that penetrates the inner tooth chamber can cause a painful root canal infection. The standard treatment for this dental condition is root canal therapy, which removes the infected tissue from the tooth. The dentists at Signature Smiles in Woodinville, WA offer a range of restorative dental procedures. They have been performing root canal treatments for many years, and patients are often pleasantly surprised to find that root canal therapy recovery is much faster and more comfortable than they had anticipated. The goal of a root canal therapy is to remove the infection from the tooth and prevent it from reoccurring. After you are made comfortable with a local anesthetic, your dentist will make a small hole in the tooth. Through this portal, the infected pulp (tissue in the tooth chamber) will be removed. Then the chamber is filled with a rubber-like substance to prevent a second infection. Typically, the final step is placing a dental crown over the tooth to provide it with needed support. Contemporary root canal therapy is considerably more comfortable than those performed in years’ past. Most patients report that root canal therapy feels similar to a standard dental filling. An infection in the tooth chamber, where the nerves are located, usually causes mild to severe pain. This pain is considered to be far greater than discomfort stemming from root canal therapy. Patients often have some swelling and tenderness during root canal recovery. However, these side effects are short-lived and minor enough to be controlled with an ice compress and over-the-counter pain-relievers. How Can I Ensure a Safe, Quick Recovery? Follow Your Doctor’s Orders: As with any dental procedure, patients should be sure to follow instructions provided by their dentist. Pre- and post-procedure guidelines are designed to keep you safe, reduce discomfort, and get you back on your feet as fast as possible. Be Mindful of What and How You Eat: In the days following your procedure, you want to take care not to irritate the treated tooth and adjacent area. This means avoiding certain foods, especially anything hard, like apples, or chewy, like steak. Hot foods should be cooled down some too, since this can cause discomfort. Patients may want to chew on the side of the mouth opposite from where the procedure was performed to facilitate comfort and healing. Gently Perform Oral Hygiene Routines: You may want to switch out your toothbrush for one with soft bristles, if you do not already have one. When brushing, do so very gently near the treatment area. Similarly, you will want to floss carefully to avoid irritating the swollen tissues. Patients are also encouraged to gently rinse after they eat, either with warm salt water or an antibacterial rinse. What Are the Signs of Complications? First, complications from root canal therapy are rare. While you will likely feel some tenderness after your root canal procedure, you should not feel severe or worsening pain. Noticeable discomfort that continues for more than a couple of days after your root canal therapy may be a sign of infection. If you are experiencing the signs of a dental infection, you should receive treatment right away to stop the pain. Reach out to us online or call us at (425) 489-1177 to make your appointment.